The taco fest runs from noon to 10 p.m. Saturday and Sunday. Alt-rock band 10,000 Maniacs will perform. 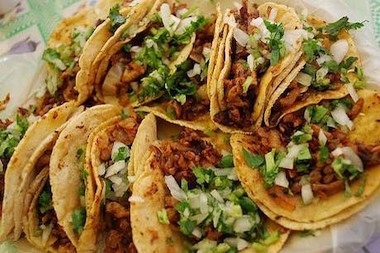 LAKEVIEW — Fifteen restaurants will take over Southport Avenue this weekend for the second annual Lakeview Taco Fest. From noon-10 p.m. Saturday and Sunday, taco fans can sample everything from tequila shrimp tacos to Portobello and lemongrass-tofu varieties. Guests will able to vote for "Chicago's Best Taco," and try any of a dozen seasonal beers on tap. Entertainment will include performances from 10,000 Maniacs and local Mexican wrestlers. There's a $5 suggested donation, which would benefit the Lakeview Chamber of Commerce. • Café El Tapatio, 3400 N. Ashland Ave.
• Café Tola, 3612 N. Southport Ave.
• Crosby's Kitchen, 3455 N. Southport Ave.
• Deleece Restaurant, 3747 N. Southport Ave.
• D.S. Tequila Company, 3352 N. Halsted St.
• Garifuna Flava, 2518 W. 63rd St.
• Mystic Celt, 3443 N. Southport Ave.
• New England Seafood Company, 3341 N. Lincoln Ave.
• Newport Bar & Grill, 1344 W. Newport Ave.
• The Pony, 1636 W. Belmont Ave.
• Si Fu Chinese-Latin Kitchen, 2116 W. Roscoe St.
• Tacos Nietos, 2863 E. 95th St.
• Toons Bar & Grill, 1964 N. Sheffield Ave.